#1 Amazon Bestseller ─ Are you seeking a deeper understanding of gender identity and sexual identity? Understanding gender identity and sexual identity: The 21st Century has seen very positive movement for LGBT+ rights. In the last few years the overturning of DOMA, the SCOTUS ruling in favor of the Marriage Equality Act, American transgender politicians elected to office, and landmark moments such as Apple becoming the most valuable company in the world under the leadership of an openly gay CEO have advanced LGBT awareness and understanding. In a world full of LGBT questions, Mardell's The ABC's of LGBT+ has the answers. The trusted voice of Ashley Mardell: We are living in a post-binary world where gender fluency and awareness of gender identity and a real understanding of our LGBT family is essential. Ashley Mardell, one of the most trusted voices on YouTube, presents a detailed look at all things LGBT+ in this remarkable book. 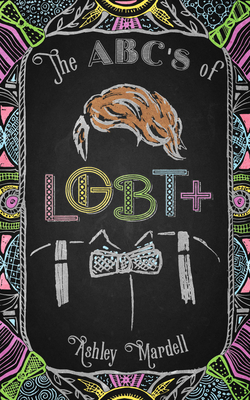 Along with in-depth definitions, personal anecdotes, helpful infographics, resources, and more; Mardell's LGBT book is proof it does get better every day in a world where people are empowered by information and understanding. In Mardell's own words, "This book is also for allies and LGBT+ people simply looking to pack in some extra knowledge... a critical part of acceptance. Learning about new identities broadens our understanding of humanity, heightens our empathy, and allows us different, valuable perspectives."